Blue Origin's New Shepard reusable, suborbital rocket has undergone multiple test flights. Jeff Bezos, the company's founder and CEO, said he hopes the company's first space tourists will fly on New Shepard in 2018. 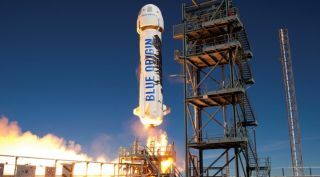 COLORADO SPRINGS, Colo. — Billionaire Jeff Bezos' private spaceflight company, Blue Origin, may have multiple uses for its New Shepard rocket, which has been primarily marketed as a space tourism vehicle. New Shepard is a suborbital rocket that will be used to send paying customers on 11-minute trips to space. The capsule can also be used for science experiments studying the space environment or the effects of weightlessness. One of the revolutionary aspects of New Shepard is its reusable rocket booster, which drops back down to Earth after launch and lands vertically. Jeff Bezos, founder and CEO of Blue Origin, said at the 33rd annual Space Symposium that he thinks the company's New Shepard booster could be used (with an additional booster stage) to get small satellites into orbit. Speaking to a crowd a special event during the symposium, Bezos mentioned the possibility of attaching a second-stage booster to New Shepard and using the dual-stage rocket to launch small satellites into orbit. "It'd be perfectly capable of being a first stage for a small orbital vehicle," he said. And for Blue Origin, one of the biggest additional benefits of the New Shepard system is the way it is helping the company design its orbital rocket, New Glenn, Bezos said. That rocket will also have a reusable booster that will land vertically, just like New Shepard. Bezos expanded on the kinds of things the company is learning from New Shepard. "The [things you learn] are often at the detail level," he said. "What kind of seals do you want to use, what kind of bearings, what kind of materials do you want to choose? And so on and so on. A lot of those details are the things that … you can't learn them at the conceptual level. You have to learn them through actual practice." Blue Origin will also use the New Shepard landing technology to help develop Blue Moon, the company's newly announced program to deliver cargo payloads to the moon, Meyerson said at the symposium. The news of Blue Moon's development came the same week that another private spaceflight company, SpaceX, announced its plans to send two paying customers on a trip around the moon. The coincidence has drawn further comparisons between the two companies, both of which are helmed by billionaire entrepreneurs and are fiercely pursuing reusable-rocket capabilities in an effort to lower the cost of sending payloads to space. Bezos said Blue Origin is working to build rocket boosters that can be reused shortly after a flight, requiring minimal inspections and refurbishments. "If you recover [a spent rocket booster] and spend a lot of time and money X-raying everything, revalidating everything, refurbishing everything, it's not actually going to lower cost," he said. "You have to [make it] much more like airline operations. You have to be able to land, refuel, maybe do some minor inspections, and then off you go again." Gwynne Shotwell, president and chief operating officer of SpaceX, shared similar thoughts in a talk earlier in the day. She, too, drew a comparison to the commercial airline industry, saying that unless a rocket booster could be turned around in 24 hours with minimal refurbishment, "it doesn't count." SpaceX has successfully launched and landed its reusable Falcon 9 rocket multiple times, and last week, the company made the first successful flight and landing of a booster that had already flown. The Falcon 9 can send payloads into orbit and is already being used to send customer payloads to space. Blue Origin has reflown a spent New Shepard booster multiple times, but those boosters have not yet been used to service customers. "I think we're very like-minded in a lot of ways," Bezos said of Blue Origin and SpaceX. "I believe deeply in vertical landing as a good architecture, because it's scalable. I think reusability is the key to lowering cost. I think you should do that first with the booster stage. Many of these things are very similar."